Mount Pleasant Granary - Monday 8th. December, 2014 – Colds update! Rose early to drive Rachel’s Bongo into Duns for its MOT test prior to being re-taxed in January. David met me and drove me home. David and I breakfasted in the farmhouse and then David fitted up temporary electric lights in the Hen House so that we can get on with the plaster-boarding this week. I emptied all of the items which had accumulated upstairs in the Hen House over the last nine months or so and together David and I cleared away some of the jumble from downstairs. We also installed a gas heater in the Hen House to keep the workers warm! After an extended coffee break in the Granary, David left and I prepared to take Mix on his walk (having missed the opportunity this morning). 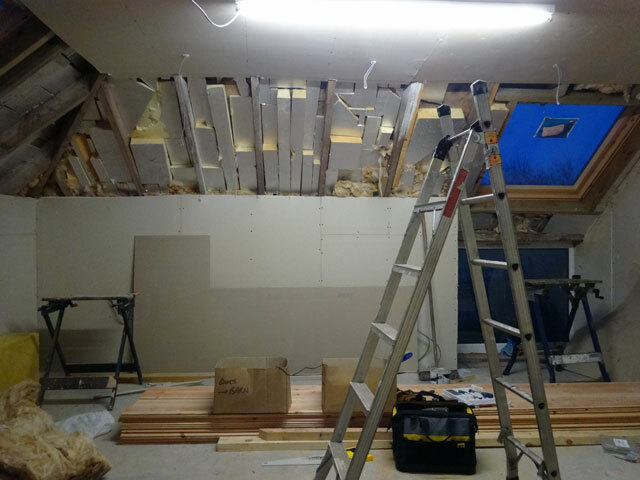 However, just as I was about to set out, Tom and Neil arrived – Tom having been in England getting his car fixed, Neil having come to spend time with Tom and keen to help with the plaster-boarding. We showed Neil all that had been done since he was here during the building of the summerhouse and then, having measured the distance from the Granary backdoor to the summerhouse, we went off to Pearsons and ordered slabs to make a walkway. This is not just to add to my comfort but is primarily to prevent mud being walked into the Granary, or at least, as much mud as is presently being trampled in every day. Tom and Neil went off to Gavinton and I finally took Mix for a walk, returning to the Granary for a heat (it is very cold today) and then to the summerhouse to catch up with some administration. We all dined together in the farmhouse and then it was good to relax for a while in front of the television before walking Mix and retiring to bed. Olive had one of her students for a tutorial today – it will be her final tutorial for just now as the examinations are tomorrow. And tomorrow Olive starts marking examinations on her computer. Today she has been ‘spring-cleaning’ the kitchen.